BlogPaws is a 3-day conference jam-packed with educational sessions led by top professionals, networking with influencers, a busy exhibit hall, exciting brand events, more influencers, and lots of pets. Pets remain at the heart of everything BlogPaws does. Our pet-friendly conferences invite all pets, everywhere in the event space. 25. Vlog: Plan now to build a video post around the brands you will meet at the conference. Keep track of the brands by following them on the official BlogPaws Sponsors 2018 Twitter list. 24. Plan Sessions: What sessions do you plan on attending? 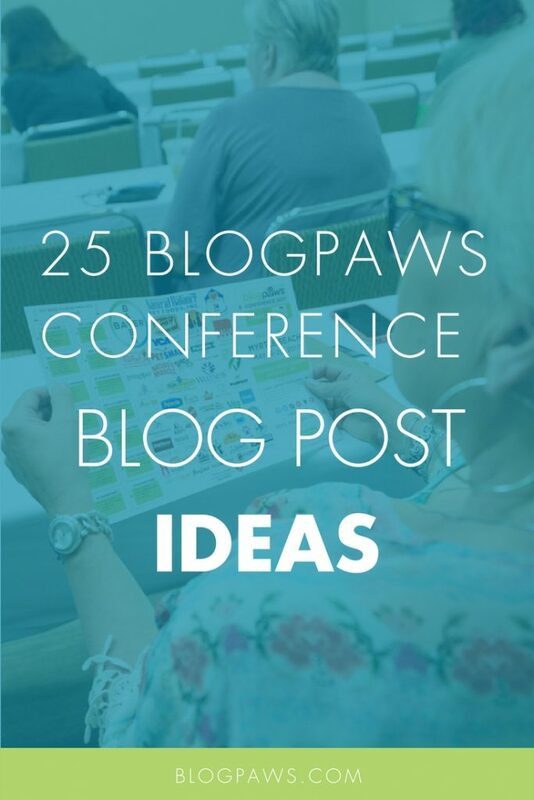 Check out the BlogPaws Sched, plan ahead, and then decide on a topic or two or more that your followers might appreciate knowing more about. Perhaps you are attending a session at BlogPaws on podcasting. So many pet parents would love to learn how to podcast: So live blog! Or blog later. The choice is yours. 23. Social Media Jam: Get your jam on with a bevvy of social media topics. In fact, why not do an Instagram Stories live from the power panel of 4 speakers on the Instagram session? 22. Health and Wellness: In checking out the brands in attendance, find out which ones have health and wellness related angles. Those types of stories are evergreen and if you can infuse the sponsors and get on their radar, it’s a win-win! 21. Pet Friendly Travel: This is one topic on which all pet bloggers and pet influencers can agree. 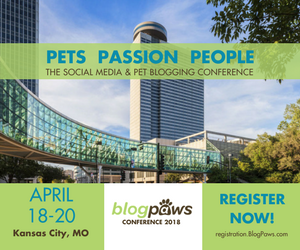 Since BlogPaws is a pet-friendly conference for well-behaved pets, take the angle of things you can do with your pets, show your readers the Kansas City, Missouri, area, and take the advice of BlogPaws’ 2018 Conference ambassador, Alison Reder, with her Pet Friendly Kansas City blog post. 20. Do a Swag Bag Unveiling: You will get a swag bag full of goodies at the conference and different things throughout the conference. Show your readers, even give some away and have a fun contest around the swag. Here are some more ideas from Maggie Loves Orbit, who is speaking at the conference. 19. Cover the Fun Elements of the Conference: Of course, any pet friendly conference means there is fun involved. Since this is our 10th Anniversary Conference, why not show your followers all the fun you had. In 2017, Beagles and Bargains wrote about her experience, with plenty of fab photos. 18. Red Carpet: On Friday evening, April 20th, the red carpet experience hits BlogPaws for the Nose-to-Nose Pet Blogging and Social Media Awards. You have to see it and experience it to believe it. Lots of pomp and circumstance, surprise, photographers, videographers, and pets! Add an entertainment angle to your blog post. 17. Cover the Cat Lounge: Meowza! You know we always want to give you something special for the feline fanatics at our annual BlogPaws conference and we usually turn to cat style expert Kate Benjamin of Hauspanther for her coordination skills with the Cat Lounge, but this year Kate is taking a bit of a hiatus to deal with some health issues (more details on her new personal blog FelineSoFine.com, because of course she created a blog about it!) Kate is going to work behind the scenes to orchestrate a really cool cat lounge experience for you this year and we’ve got a great team of volunteers to make it happen, so you definitely have something special to look forward. 16. Report About Your Live Cat Psychic Reading: Coryelle Kramer, Seer and Communicator, will be joining us in the Cat Lounge this year. Be sure to stop by to let her do a reading for you!! Then blog about it! 15. Interview Attendees: I love an interview style post and I am not alone. If you do a Facebook Live during the conference and set up some interviews, you can later embed the video into a blog post like we did here. 14. Share Pet Photo Taking Skills: Kornell Samuels shares all of his behind-the-lens tips and tricks during his BlogPaws session. Learn the basics of your mobile device, as well as how to light and style your shoot. At the end, you’ll see a notable difference in your photography! Impressive photography has the power to take your blog or website to the next level. In this class, Kornell Samuels will show you how to take photos that will make your content stand out. At the end of this class, you will know the essentials of mobile photography, lighting, and composition. Plus, your readers will notice your new photography skills! 13. What’s New on the Brand Radar: Ask brands at their booths what they have out that is new or what they have on their radar. Take notes, take pictures, and take video. Share the hottest trends, products, and pet industry insights with your readers. 12. How to Become a Pet Care Professional: There are endless opportunities in the ever-changing $70B pet industry. Are you thinking about tomorrow? Your current role as pet industry influencer can lead to any number of new entrepreneurial opportunities such as in-home pet care, animal training, behavioral counseling, animal facility management, or animal welfare, just to name a few. Jamie Migdal, Fetch Find founder, will teach you how in her session. Fill your readers in! 11. Good Pet Behavior: Since BlogPaws is welcoming to well-behaved pets, write a blog post about how to socialize your pet. Include interviews with experts, some of whom might be in attendance at the conference. Jamie Migdal is a pro, so look her up in April. 10. Teach Your Readers to Plan: Jodi Chick will lead a table topic aimed at helping planner neophytes and those who have tried using a planner, but never made it stick, attendees will be introduced to a variety of planner styles and help build the foundation on which to develop their blog planner as a time management, branding, and organizational tool, instead of a to-do list. Attendees will also be given access to a downloadable workbook to complete after the conference helping the further develop their planner and how to best use it to improve their blog. 9. Interviews with Winners: Talk to some of the winners of the Nose to Nose awards and let your readers in on their blogs, their insights, and gain some fresh material for a fun blog post. 8. 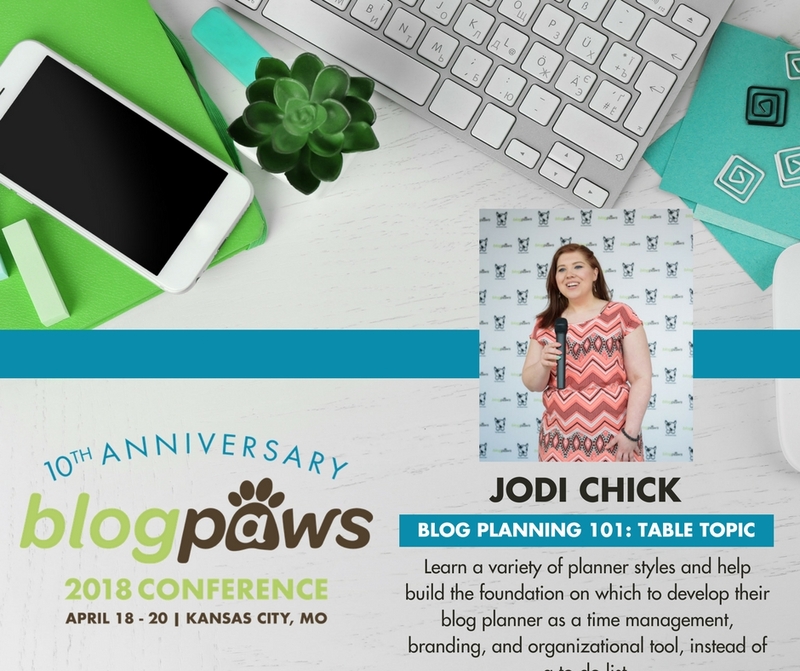 A Day in the Life of a Pet Influencer: Prep this one in advance and then fill in the details post con, or for more fun and hands-on engagement with your followers, do a day in the life at BlogPaws on social media, hype it in advance, and then write a blog post about it afterwards. Re-purpose those IG videos, too! 7. How to Be a Twitter Influencer: Twitter is not dead; in fact, some experts believe its find its second win. Show your readers the magic of Twitter, share tips and insights and hashtags with them, follow the #BlogPaws hashtag throughout the conference, and use our Twitter Influencer tips. 6. How to Make Grow a Pet’s Social Media Account: You will get a ton of tips on this during the BlogPaws Conference, so condense them into a blog post and tell your readers how to do it from the pros! 5. The Pets Behind the People: I love getting to know the pets of the bloggers and influencers. How many times does someone meet you and they know your pet before they remember your name? That happens to me quite often, I am happy to report. Interview the people about their pets and share images and stories on your blog. This would even make for a perfect series of blog posts. 4. Show Your Readers: Do a video and photo post interspersed with just enough text to make the Google Gods happy. The topic? To celebrate our 10th Anniversary there will be special Experiential Areas set up in the Exhibit Hall this year! There will be a patio area, a kitchen, a living room, and an office. Each of these areas will have fun things to check out, Brands to get to know, and maybe even some educational tools for you to take home. Stay tuned as we get closer to the Conference for updates. 3. Honor Flags: Dedicated a day on your blog on ways to honor a pet who has passed on. 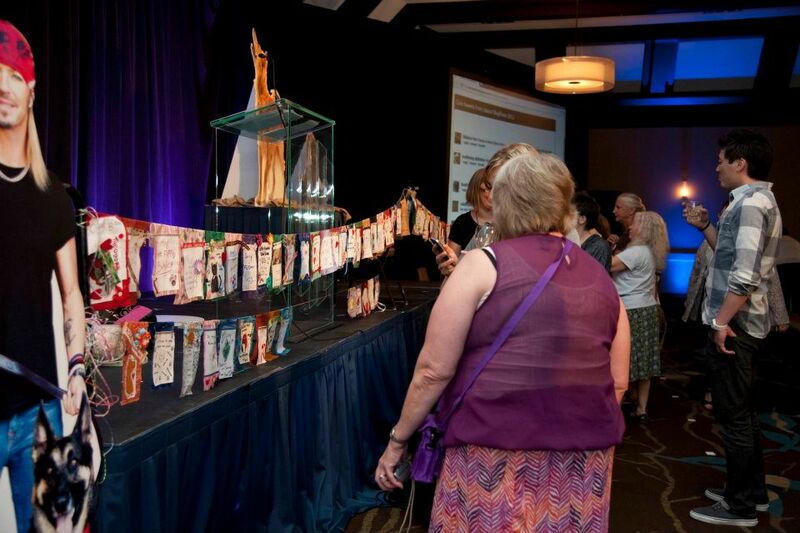 At the conference, honor flags are back: It is time to bow our heads, show love and remember, and this year’s BlogPaws Conference will play host to the time-honored tradition that is Honor Flags. Honor Flags remember our dear pet companions who are no longer with us and honor all who are dedicated to rescuing animals. Supplies will be available at the BlogPaws Conference and each flag will represent a pet you wish to honor. Whether you are an artist or not, honor flags are designed to remember those we love and have lost. Express yourself, share the love and the bond with your pets, and take some quiet time to create a keepsake that will grace the honor flag and for you to take home as a remembrance. 2. Misconceptions about Pet Bloggers and Pet Influencers: Myth buster posts and those that dispel misconceptions are always a hit if done right. Think of some misconceptions, get quotes at the conference from attendees, and infuse them into a blog post. 1. Experience Review: From start to finish, show and tell your readers what you just did for 3+ days with hundreds of others in attendance.